This is the sort of picture that makes you look twice. At first glance you ask yourself: “what is that picture about?” Answer: it is a quirky, cartoonish image of two puppet-like chessers. They are reminiscent of Hank and Mexican Pete from the fifties, although you may, I hope, have a more contemporary personal reference. They look as if they are hinged at the shoulder, elbow, knee and so on; they sport jaunty garb, albeit in subdued earth colours. The left hand puppet figure has already seen (in a chess sense) the imminent coup de grace and looks a touch bored as he waits for the inevitable. The puppet on the right scratches his forehead and checks the variations; he hesitates before he swoops to bash out the killer move his opponent has seen coming. So, you have answered the first question; you know what image the artist has made. But you feel obliged to take a second look and ask: “how does the artist do it?” Well, in wood is the unlikely answer and it could be at least three or four feet high, maybe more. There are some clues about the medium in the photo image, that probably aroused your suspicion: the graining for example, the flat colouring, and the crisp curvilinear silhouette. You can just see shadows cast by the edges of the hair, hat, clothing. It is Alan Boileau’s signature method. He creates contemporary bas-reliefs in layers of stained or coloured Canadian pine an inch or so thick. There could be one, two or more strata to build up different parts of the picture. If you could see it at close quarters you’d see the layering for what it is, and you’d poke out your eye on the protruding corner of the chess board, an accident waiting to happen if ever I saw one. So, leaving health and safety issues on one side, the second question is answered, you know how he does it. Job done. Well, not quite. With these two questions we risk getting mired in the bog of the Craft/Art distinction: the “how” in relation to the “what”. Philosophers have pondered this issue hoping to help us from being sucked under. One clear, not to say prosaic, distinction is that craft is put to the service of producing something useful. So, unless that jutting chess board is intended to be a coat hook, this work is definitely intended to be art. Craft is the application of hands-on skill and technique, and there is no doubting it here, though admittedly this frontal image doesn’t help you to see it. But other web images shot from an angle (www.alanboileau.com), though not of this piece, strikingly reveal that the flat image has depth and is very skilfully crafted. This brings me to my reservation about this sort of thing. The medium is the rather too much of the message. If you eliminate the layered craft work, and see it again in just two dimensions, then what you have is just the comic strip image you saw at first glance. If it ranks as art, it is not art of a high rank; to my taste anyway. However, Alan Boileau also makes rhythmic abstract images using the same technique, and these work better for me. 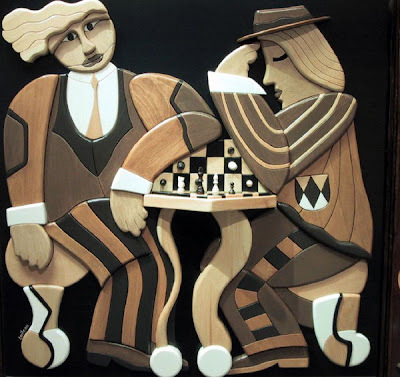 In his representational works (such as the chess players) the method, when you can see it in 3-D, shouts “LOOK AT ME!” In these other works the craft combines with the abstract image to say “look at us”. Craft and Art speak together with no distinction. 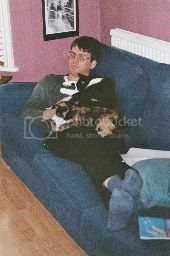 Is Justin give you advance notice of these pictures Martin? How can you come up with all that so quickly? "Is Justin giving you advance notice of these pictures ? How can you come up with all that so quickly?" I'm sure you didn't mean to, but you have put me on the horns of a dilemma, which is always painful. "No" and I'll sound more of a clever clogs than I pretend to be; "Yes" and I'll sound like more of a fake than I'd wish to be. I believe Martin actualy writes the screeds in advance: he just fills in the names on the day according to what work I actually decide to post. C'mon Justin, you know it's not quite like that. It's not that I change the name. It's that you change the picture. Sorry to find you sitting on a horn this morning Martin. I find your contributions both entertaining and impressive either way.